The larger and more massive galaxy is cataloged as NGC 2207 (on the left in the Hubble Heritage image), and the smaller one on the right is IC 2163. Strong tidal forces from NGC 2207 have distorted the shape of IC 2163, flinging out stars and gas into long streamers stretching out a hundred thousand light-years toward the right-hand edge of the image. Computer simulations, carried out by a team led by Bruce and Debra Elmegreen, demonstrate the leisurely timescale over which galactic collisions occur. In addition to the Hubble images, measurements made with the National Science Foundation’s Very Large Array Radio Telescope in New Mexico reveal the motions of the galaxies and aid the reconstruction of the collision. The calculations indicate that IC 2163 is swinging past NGC 2207 in a counterclockwise direction, having made its closest approach 40 million years ago. However, IC 2163 does not have sufficient energy to escape from the gravitational pull of NGC 2207, and is destined to be pulled back and swing past the larger galaxy again in the future. The high resolution of the Hubble telescope image reveals dust lanes in the spiral arms of NGC 2207, clearly silhouetted against IC 2163, which is in the background. Hubble also reveals a series of parallel dust filaments extending like fine brush strokes along the tidally stretched material on the right-hand side. The large concentrations of gas and dust in both galaxies may well erupt into regions of active star formation in the near future. Trapped in their mutual orbit around each other, these two galaxies will continue to distort and disrupt each other. Eventually, billions of years from now, they will merge into a single, more massive galaxy. It is believed that many present-day galaxies, including the Milky Way, were assembled from a similar process of coalescence of smaller galaxies occurring over billions of years. This image was created from 3 separate pointings of Hubble. The Wide Field Planetary Camera 2 data sets were obtained by Debra Meloy Elmegreen (Vassar College), Bruce G. Elmegreen (IBM Research Division), Michele Kaufman (Ohio State U. ), Elias Brinks (Universidad de Guanajuato, Mexico), Curt Struck (Iowa State University), Magnus Thomasson (Onsala Space Obs., Sweden), Maria Sundin (Goteborg University, Sweden), and Mario Klaric (Columbia, South Carolina). 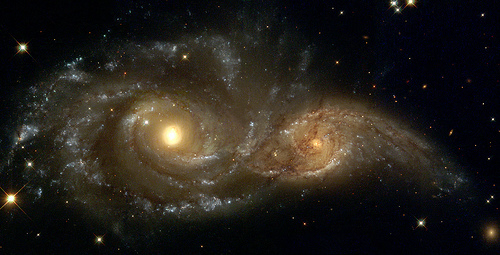 (November 4, 1999) The larger and more massive galaxy is cataloged as NGC 2207 (on the left in the Hubble Heritage image), and the smaller one on the right is IC 2163. Strong tidal forces from NGC 2207 have distorted the shape of IC 2163, flinging out stars and gas into long streamers stretching out a hundred thousand light-years toward the right-hand edge of the image. Computer simulations, carried out by a team led by Bruce and Debra Elmegreen, demonstrate the leisurely timescale over which galactic collisions occur. In addition to the Hubble images, measurements made with the National Science Foundation’s Very Large Array Radio Telescope in New Mexico reveal the motions of the galaxies and aid the reconstruction of the collision. The calculations indicate that IC 2163 is swinging past NGC 2207 in a counterclockwise direction, having made its closest approach 40 million years ago. However, IC 2163 does not have sufficient energy to escape from the gravitational pull of NGC 2207, and is destined to be pulled back and swing past the larger galaxy again in the future. The high resolution of the Hubble telescope image reveals dust lanes in the spiral arms of NGC 2207, clearly silhouetted against IC 2163, which is in the background. Hubble also reveals a series of parallel dust filaments extending like fine brush strokes along the tidally stretched material on the right-hand side. The large concentrations of gas and dust in both galaxies may well erupt into regions of active star formation in the near future. Trapped in their mutual orbit around each other, these two galaxies will continue to distort and disrupt each other. Eventually, billions of years from now, they will merge into a single, more massive galaxy. It is believed that many present-day galaxies, including the Milky Way, were assembled from a similar process of coalescence of smaller galaxies occurring over billions of years. This image was created from 3 separate pointings of Hubble. The Wide Field Planetary Camera 2 data sets were obtained by Debra Meloy Elmegreen (Vassar College), Bruce G. Elmegreen (IBM Research Division), Michele Kaufman (Ohio State U. ), Elias Brinks (Universidad de Guanajuato, Mexico), Curt Struck (Iowa State University), Magnus Thomasson (Onsala Space Obs., Sweden), Maria Sundin (Goteborg University, Sweden), and Mario Klaric (Columbia, South Carolina).